Question: When we speak about the unity of the Israeli nation, to what extent do we expand this concept? Answer: It includes all the Jews. After all, they are the descendants of Abraham’s group that took upon itself to be one whole, “as one man in one heart.” It isn’t a question of religion; the Jews simply have a Reshimo, a spiritual gene, because they already fulfilled mutual guarantee in the past. We may say that after the exile of the Jewish nation and its mixing with others, this Reshimot now exist in everyone. It is true, and yet this is the obligation of the Israeli nation. People with a point in the heart that pulls them upward (•), no matter where they live, join the Bnei Baruch organization (BB). There is also the part called “Israel in this world” or “Jews,” who at the moment have “quiet Reshimot,” points in the heart (•) that have not awakened yet, which, on the contrary, pull them downward. After all, they are using the force of bestowal in order to succeed in their dealings in this world. Finally, there is the part called the “nations of the world”: They have a point in the heart (•) hidden even more deeply that are hardly noticeable, which pulls them even further downward. 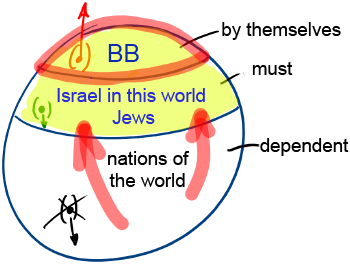 As a result, people with points in the heart who have awakened are drawn to correction by themselves; the people who belong to “Israel” must be corrected, and the “nations of the world” are left in a state that cannot be envied, meaning that they depend on the levels above them that are responsible for the correction. This is why we need to disseminate the wisdom of Kabbalah among the Israeli nation. Otherwise we would keep silent like Kabbalists in previous generations. A new era has begun and although dissemination is a burden that none of us wants, we have no other choice. Baal HaSulam wrote about it in the article “Messiah’s Shofar,” in The Nation newspaper, and in other places. Question: What will the rest of the development of people from the second layer be like? Answer: They won’t be able to do anything on their own; they will have to join us and to learn to help us actively. They will understand in their mind and their feelings that they must participate in the correction. Their point in the heart has not awakened yet and they are aware of the need for it rationally, simply because otherwise there are troubles. Then they will turn to us: “We must unite, help us do that!” and we will help. They will not yearn for the Creator, but for a secure life. We are pulled upward by a desire, while their desire is to manage in this world, yet at the same time they are able to unite. Only later will the spiritual spark awaken in them, and also in the “nations of the world.” After all, it says that at the end of correction they shall all know the Creator from the smallest to the largest.